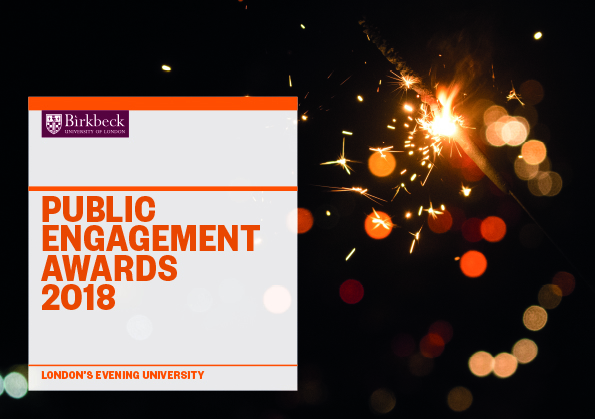 Mary-Clare Hallsworth, Public Engagement Manager at Birkbeck, University of London outlines the College’s approach to categorising public engagement for the inaugural Public Engagement Awards. Recently at Birkbeck we ran our first ever Public Engagement Awards. The aim of the awards is to showcase and reward the great public engagement with research that goes on in our College. Thankfully there is plenty of it to reward so we didn’t need to overcome that particular challenge but instead we needed to make sure that the breadth of engagement practice was well represented and colleagues felt there was a category that they could apply for. A lot of thought went into what our award categories should look like. There is quite a variety of models out there for categorising and dividing up public engagement. You can group PE by who is doing it, who it is being ‘done to’ (! ), who is involved, reasons for the engagement or methods used – this is even before we start arguing over the nuances of the various definitions for public engagement (what should/shouldn’t be included?!). Personally I like to avoid defining public engagement as a ‘thing’ altogether and prefer to think of it as an ethos – an underpinning way of conducting yourself and your research. This breaks the need to ask things like ‘does a blog count as public engagement?’; the answer to this is always ‘depends how you use it’, which is an irritating response. Instead, thinking of public engagement as an ethos enables us to think about the plethora of methods available as tools and choose the ones most useful and relevant to both the research and the community involved. To narrow down potential categories we looked at awards run by Queen Mary, University of London, University College London (check out their experiences! ), Oxford University and, of course, the National Coordinating Centre for Public Engagement (NCCPE). We also looked at definitions of public engagement from RCUK, the Wellcome Trust, NCCPE and various categorisation of public engagement within reports, the most enlightening being: Reviewing Public Engagement in REF 2014 by NCCPE, The State of Play Report commissioned by Wellcome and RCUK and the Factors Affecting Public Engagement by UK researchers. Because the language we use about what we really mean by public engagement is not universal and differs significantly by discipline we also had to take into account the language we used to describe each of the categories (full category descriptions at the end). On the whole I think these worked well. We did receive a good number and range of applications from all the Schools in the College for all of the categories. There were noticeable gaps though. Applications to the Engaged Practice category were a little low for my liking. Additionally, pockets of some departments were completely missed. Our Geography department, for example, does some great work which I would put firmly in the ‘Engaged Practice’ category but there was not a geographer in sight. We clearly didn’t get the messaging and language right for them – definitely something to think about for next year! This award recognised excellence in communicating research projects and ideas through stimulating or innovative activities. These activities aimed to: Inspire wonder, curiosity and learning; challenge conventional wisdom or provoke scrutiny and debate amongst their targeted publics. Classic forms of communication may have been used for this work including talks, workshops and media work (such as contributing or creating TV, film or radio content, appearing as a ‘talking head’ in factual programming), as well as publishing articles in non-scholarly outlets. Innovative use of websites and social media for communication were also considered in this category. Applicants were asked to note the distinction between activities which are ‘publicly available’ as opposed to communicating to the public. Publicly available activities are scholarly activities such as conference talks or lectures that are made available to the public rather than those specifically designed for a particular non-academic audience. Publicly available activities did not fall within the remit of these awards. This award recognised engagement based on an active collaboration and a two-way relationship with an external partner(s). Collaborators might have included museums, charities, schools, individuals and artists, arts organisations or social enterprises who work with the researcher/s to reach their public/s. Collaborations in this category often resulted in the development of new pieces of work, exhibitions, performances or resources. This type of engagement usually looks to prompt new ideas and ways of working, build skills/ knowledge on both sides of the collaboration, whilst providing publics with access to research and opportunities to get involved. With these types of projects the true engagement could be said to be with the collaborator rather than the public, although the outputs of the collaboration often add an additional level of engagement with a wider public. This award recognised research that has participation and involvement of publics as a core approach to the creation of research. Projects in this category could be described as community engagement, participatory research, co-production of knowledge or socially engaged practice amongst many labels. This type of research works directly with a community of place/interest in order to: empower the subjects of the research; use dialogue and deliberation to influence the research; build networks; develop skills or improve the health and well-being of those involved. This form of engagement often takes years to establish relationships enabling publics to share their knowledge and expertise and can often contribute to issue-based awareness, support activism or take a ground up approach to policy change. This award recognised research engagement activities which aim to stimulate change within our culture and society. These projects tend to work ‘behind the scenes’ to influence organisations, professional groups or policy makers. Activities were designed to: inform decision making; encouraged scrutiny and debate; galvanise change and influence the behaviours and practices of organisations or groups who work in the public realm. Common strategies for affecting influence might include: commissioning artworks/film/theatre; input/creation of think-tanks and advisory groups; workshops for professional groups and policy makers; collaborating with businesses/communities to provide a service or influence a change in practice. Note: Collaborations within this category tend not to produce single new pieces of work but rather change the way in which a group/organisation approaches work. The Early Career Award recognised the public engagement work of doctoral students or early career researchers (ie Post-Docs in their first two years in post). This included projects where the applicant has spearheaded a project or contributed significantly to a larger project.